This new SL3 Slim Line LNB receives satellites 99, 101 and 103 and provides support for 13 tuners without an external multiswitch. This is just the front portion, this does not include the reflector or any other accessories. Unlike the SL5, the SL3 receives satellites 99, 101 and 103. The dish you choose depends on what satellites your locals are broadcast on. 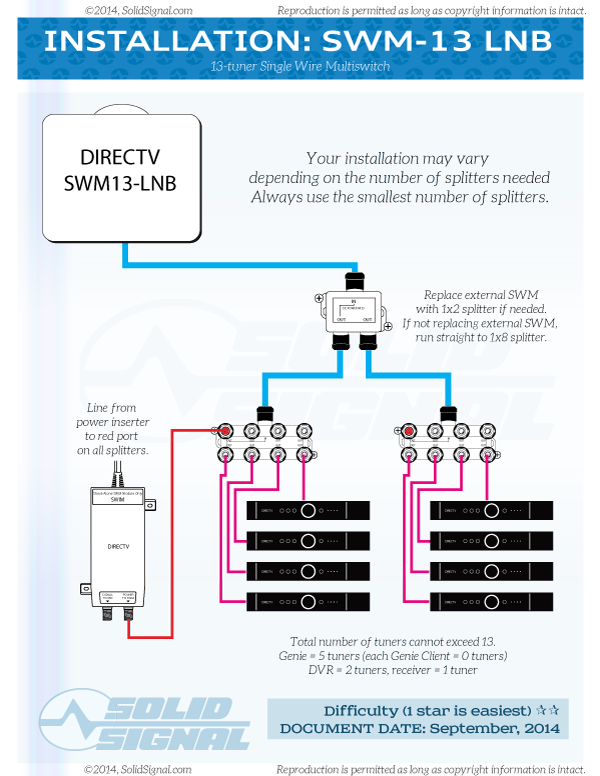 This new DIRECTV LNB gives the ability to run a Genie plus up to seven receivers or four DVRs on a single wire. Check out our exclusive review of the SWM13 LNB! Learn how to upgrade your dish with our downloadable guide! Click here to download this diagram in PDF format! It's been working well winter and summer. I installed a SWM13 LNB in January and here it is the end of August, so it's seen a wide range of weather conditions. I've been feeding 11 tuners off of a single wire and it works fine.